Burton Joyce is a village minor waterways place place on the waterways major waterways place village town city on the River Trent (non-tidal section) between Fiskerton Wharf (8 miles and 7½ furlongs and 2 locks to the northeast) and Stoke Bardolph (1 mile and ½ furlongs to the south). 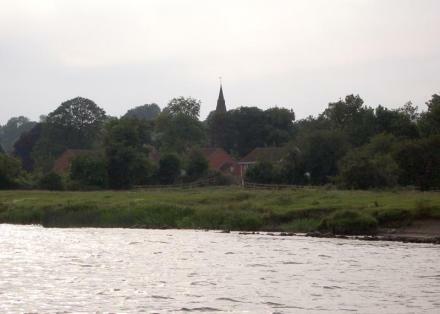 The nearest place in the direction of Fiskerton Wharf is Gunthorpe Bridge; 2 miles and 2¾ furlongs away. Burton Joyce is a large English village and civil parish in the Gedling district of Nottinghamshire, about 7 miles (11 km) east of Nottingham, bounded by the smaller Stoke Bardolph to the south and Bulcote to the north-east. The A612 links it to Carlton, Gedling village and Netherfield to the south-west, and Lowdham to the north-east. Initially the site of an Iron age fort, it was occupied by Norman nobility, who founded St Helen's Church. From being a small farming community, Burton Joyce grew in the early Industrial Revolution, earning a reputation up to the 1920s for quality textile products. Many of the 3,443 population commute to Nottingham. It forms with Stoke Bardoph and Bulcote the Trent Valley ward of Gedling, which elects two councillors. Church Rd, Nottingham, NG14 5GB — 383 yards to the north. Stoke Bardolph, Nottingham, NG14 5HX — 1612 yards to the south. Main St., Nottingham, NG14 5DX — 366 yards to the northwest. Burton Joyce — 1145 yards to the northwest. Chestnut Grove, Nottingham NG14, Burton Joyce, NG14 5DN — 176 yards to the north. 11 Main Street, Nottingham, NG14 5DX — 389 yards to the northwest. Nottingham — 449 yards to the west. Church Road, Burton Joyce, NG14 5 — 253 yards to the northwest. 113-115 Church road, Burton Joyce, NG14 5DJ — 285 yards to the north. 1 Loxley Meadow, Nottingham, NG14 5ET — 493 yards to the west. 140 Nottingham Road, Nottingham, NG9 8AR — 1482 yards to the west. 162 Nottingham Road, Nottingham, NG9 8AR — 1617 yards to the southwest. Law and Social Sciences Building, University Park, University of Nottingham, Nottingham, NG7 2RA — 405 yards to the west. Burton Joyce, Nottingham — 252 yards to the northwest. GelWorks HQ, Nottingham, NG14 5HA — 1462 yards to the northeast. 69 Main Street, Burton Joyce, NG14 5ED — 456 yards to the north. Nottingham — 352 yards to the north. Loxley House, Nottingham, NG2 3NG — 504 yards to the west. Station Road, Nottingham — 510 yards to the southwest. Nottingham, NG14 5 — 517 yards to the northwest. Nottingham — 615 yards to the north. 37 Main Street, Burton Joyce, NG14 5EB — 376 yards to the northwest. 149 Main Street, Burton Joyce, NG14 5EL — 781 yards to the north. 11 Corporation Cottages, Bulcote, Nottingham, NG14 5GY — 1439 yards to the northeast. 36 St Helens Crescent, Burton Joyce, NG14 5DW — 259 yards to the west. 102 Lambley Lane, Nottingham, NG145BL — 1134 yards to the northwest. 48 Main Street , burton joyce, Nottingham, NG14 5DZ — 352 yards to the north. Nottingham — 201 yards to the northwest. Church Road,, Burton Joyce, NG14 5GR — 253 yards to the northwest. 49C Main Street, Nottingham, NG14 5DX — 375 yards to the north. CHURCH RD, Nottingham, NG3 4 — 253 yards to the northwest. SweetVibes HQ, Nottingham, NG12 — 740 yards to the southwest. Trent Road, Burton Joyce, Nottingham — 279 yards to the northeast. 60 Chesterfield Drive, Burton Joyce, Nottingham, NG145EQ — 669 yards to the north. The Old School, Burton Joyce, Nottingham, NG14 5 — 252 yards to the northwest. Unit 5, Heathcoat Building, Nottingham Science & Technology Park, Nottingham, NG7 2QJ — 405 yards to the west. The Old School Building, Main Street, Burton Joyce, Nottingham, NG14 5DZ — 367 yards to the northwest. Poplars Sports Ground, Station Road, Burton Joyce, Nottingham, NG14 5AN — 734 yards to the southwest. The Poplars Sports Ground, Station Road, Burton Joyce, NG14 5AN — 693 yards to the southwest. 6 Lambley Lane, Nottingham, NG14 7 — 442 yards to the northwest. burton joyce park, Nottingham, NG14 5 — 217 yards to the northwest. Main Street burton Joyce, Nottingham — 367 yards to the northwest. Station Road, Burton Joyce, NG14 5AN — 736 yards to the southwest. Old School Building, 5 Chestnut Grove, Burton Joyce, Nottingham, NG14 5DP — 326 yards to the north. Trent Lane Burton Joyce, Nottingham, NG14 5EY — 304 yards to the north. 1605 yards to the southwest.